We are now about halfway through the summer holidays. Despite your best intentions that every day of the holidays will be productive, rewarding, and jam-packed with memorably fun activities, there always seems to come at least one day where you find yourselves slumped in front of the air conditioner watching non-ratings season re-runs on TV. Perhaps this is what has inspired me to cover a name from Australian television. The Sullivans is one of Australia’s most successful soap operas. 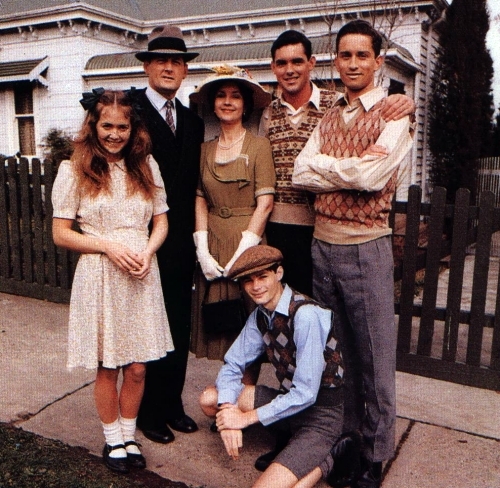 First aired in 1976, it centred on an ordinary middle-class Melbourne family, and the effects that World War II had on it. The war gave endless opportunities for dramatic plot-lines; various members of the Sullivan family, and their friends and neighbours, went off to battle, worked as nurses, opposed the war, developed psychological problems, married people from different countries, got divorced, committed suicide, were lost at sea, ran the black market, went to prison, were interned as enemy aliens, shot by the Nazis, killed by bombs during the London Blitz, and had to adapt to peace-time conditions. The show’s producers went to great lengths to ensure historical and cultural accuracy. Not only did the sets use authentic period furniture, but even the weather in the show mirrored that which actually occurred on each day during the war. This attention to detail and high production standards, not to mention a new nostalgia for the recent past, made the show a success. A consistent ratings winner which gained the acclaim of the critics, it won five Logie Awards in 1978 and was the first Australian drama series to be sold overseas; more than 45 countries broadcast The Sullivans, where it was most popular in the United Kingdom. It made a star of Lorraine Bayly, who played dignified matriarch Grace Sullivan, and employed dozens of Australasian actors in supporting roles. Like all good soaps, it provided a testing ground for young actors, and it was on the set of The Sullivans that later big names such as Mel Gibson, Kerry Armstrong, Kylie and Dannii Minogue, Sam Neill, Gary Sweet and Sigrid Thornton gained early experience. Ratings for the show suffered after fan favourite Grace Sullivan was killed off, and as time went on, the war finished and most of the main characters were dead or had otherwise been written out. There was some talk of continuing the story into the 1950s and showing how Australia changed in the post-war era, but it was decided to let it come to an end in 1983. Sullivan is an Anglicisation of the Irish surname O’Sullivan, which means “grandson of Súilleabhán”. The meaning of Súilleabhán is disputed, but one theory is that it means “dark eyed”. There are also Sullivans whose family name is derived from Súileacháin, meaning “quick eyed”. The O’Sullivans originated in County Tipperary, and the original Súilleabhán was a direct descendant of one of the kings of Munster, so his dynasty is of royal blood. The O’Sullivans also claim descent from the first Celts to colonise Ireland, migrating there from northern Spain in 800 BC. Although this story is mythological, it does have some truth to it, for DNA studies show that the Celts of Britain and Ireland (all Celts, not just the O’Sullivans!) are descended from a tribe of Iberian fisherfolk who migrated there about 6000 years ago, and formed what is considered to be the indigenous population of the British Isles. In fact, nearly everyone in Britain is descended from them, and any of us who have British and Irish ancestry are too. Famous Australians Sullivans include Pat Sullivan, who helped create Felix the cat; Victoria Cross recipient Arthur Sullivan; Olympic swimmer Eamon Sullivan; and Paralympic athlete Tim Sullivan. Actor Sullivan Stapleton, who starred in Animal Kingdom, is a rare example of it as a first name. Sullivan has never charted in Australia, and only a few with the name can be found in old records, although it is reasonably common as a middle name. In 2012, there were 16 baby boys given the name Sullivan in Victoria. In the US, it is #524 and rising briskly up the rankings; in England/Wales, it is #970, and also trending upward. Last year country music singer Melinda Schneider welcomed a son named Sullivan James Gable, and this may help raise the name’s profile in Australia. Sullivan is a name from Australian popular culture, and more specifically, it is one from Melbourne, where The Sullivans was set and filmed. It feels modern, yet at the same time rather nostalgic, looking back to the 1970s and ’80s – who in turn were looking back with nostalgia at the 1940s. Irish-surnames-as-first names are a great favourite in Australia, as in other countries where a significant proportion of the population claim Irish heritage. For those wanting something more unexpected than old favourites like Ryan or Darcy, I think Sullivan fits the bill of being something that’s recognised as a “real name”, while still underused. Sully or Van could be used as nicknames. POLL RESULT: Sullivan received an approval rating of 96% – the highest-rated featured boys name of 2013, and the highest-rated overall. 40% of people thought it was okay, and nobody disliked it.